Placement of Cloud init Script is Present via Web GUI in Horizon. Here is the Basics of OpenStack Customization Script For Automation in HP Cloud. Possibly you have heard about Cloud Automation, OpenStack Heat Templates. 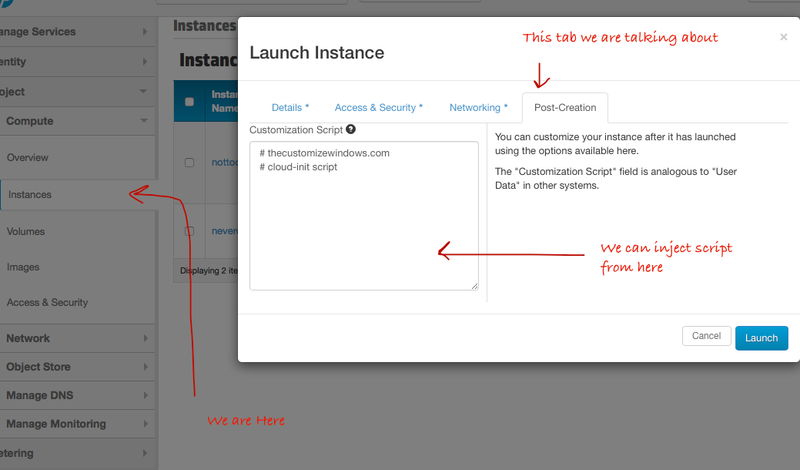 If you are not understanding about which thing we are talking about – this is blank field that is given as option in the Launch Instance popup menu in Horizon. The option name “Post Creation” which sits beside – [Details] [Access & Security] [Networking] as forth option. OpenStack is written in Python. We can use the OpenStack Python Client Tools from desktop to inject our script or can use the Web GUI of Horizon. We are avoiding terminologies to make it usable to the ordinary users. We are working with Ubuntu instances for this guide. You can open the screenshot in full size by clicking here. The last one will give you the idea – cloud init is enabled. So, for the next instance, if you use a script; you can use the same script few billion times for creation of instances ready with the softwares you need, like creation of an instance running Nginx. cloud init is the default VM bootstrapping system on Debian (and Ubuntu), Fedora and Red Hat Enterprise Linux. This guide in technical word is about using CloudInit inside OpenStack Heat. cloud init documentation is unreadable for practical purpose. We know that the OpenStack Heat implements injection in Python for the VMs. This injection is possible by passing information to the VM. This is decoded by Cloud-Init. Size is the limitation from GUI. 16 KB is the limit. The above example is by Rackspace. Practically you’ll get examples of using cloud init from Amazon’s huge number of user scripts plus there are the Heat templates from Rackspace – doing a bit reverse engineering will make them working on HP Cloud or OpenStack own installations. This Article Has Been Shared 4003 Times! Cite this article as: Abhishek Ghosh, "OpenStack Customization Script For Automation (HP Cloud)," in The Customize Windows, May 19, 2015, April 23, 2019, https://thecustomizewindows.com/2015/05/openstack-customization-script-for-automation-hp-cloud/.